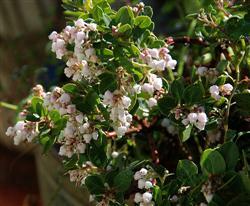 This manzanita is a dense shrub with shiny red bark that looks great with the bright green foliage. The new growth is an attractive reddish color and the blossoms are a pretty white color. This shrub tends to grow in a round form without pruning and has very dense foliage.